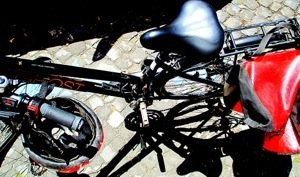 The plan was to sleep a bit late, thinking I would need the extra rest for my bike tour along the Ancient Appian Way. A bit after 8:00, I was awakened by someone out my window….my room is on the 6th floor. I was aware there was scaffolding out there, just didn’t think beyond that. Anyway, with the whistling (musical, not at me), the tromping to and fro and …let’s just say Italian communication…I decided to slither out of bed (yes my window has shutters, but they are open a bit and slats are missing and yes my window has curtains, but they are very sheer) and hole up in the bathroom for a bit. 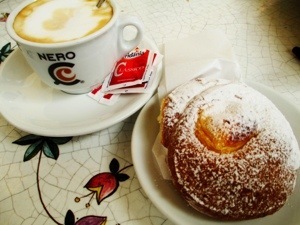 So, PLAN B. I got over (kinda) the mental hump of wearing longish shorts and keds, got dressed and went down to my Pasticceria for my morning fix. I brought along my ipad thinking this was a good time to do a bit of reading and research. I sat there trying to take it easy and just enjoy the morning until my 2:00 tour…but I obviously have difficulties with that….I decided the churches I wanted to see were not that far from my room, I had a couple of hours, so I ran back up to my room, grabbed a couple of necessities and started making my way. I won’t go into my navigational issues….wait, is it me or is it Roma? 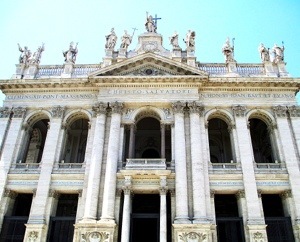 But I did pretty good finding Basilica di Santa Maria Maggiore. 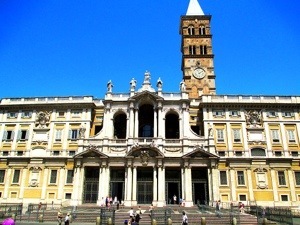 Santa Maria Maggiore is the largest church in Roma dedicated to Mary. Construction began in 435 AD. So this church makes our Saint Mary’s look small and new! Going into a church of this magnitude is overwhelming for me. There is so much to see and even more to learn. Knowing I had a bit of a time limit, I took in the highlights. The urn holds several pieces of wood from Jesus’ crib. 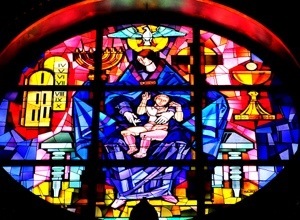 This stunning stained-glass has such a contemporary almost cubist feel to it. 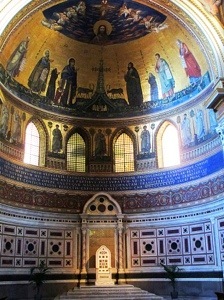 As I exited, I asked a Padre the direction of another basilica on Rick Steve’s Pilgrim’s Tour. “Straight down this street.” Straight down…how could I turn back now? 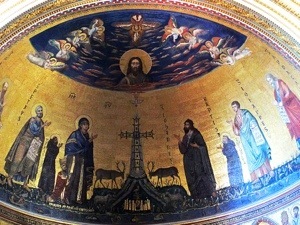 On to San Giovanni in Laterano. 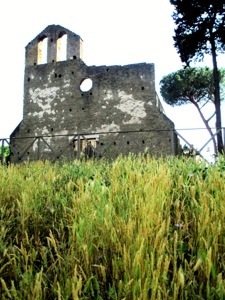 This was the first Christian church in Roma. It opened in 318 AD. 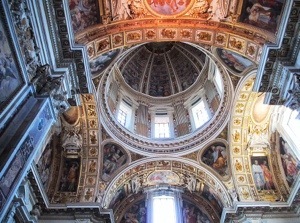 It was the home of the popes until the renovation of Saint Peter’s during the Renaissance. It is still owned by the Vatican. At the entrance, there is a statue of Constantine, the emperor who legalized Christianity. I find the doors an interesting detail. 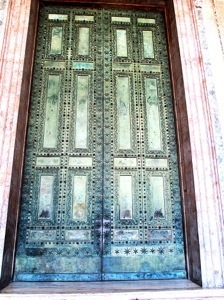 These were the original doors of the Roman Senate (3rd Century). The church had them moved in the 1650s to remind the population that the Church was now Europe’s lawmaker. Leaving San Giovannni, I make my way back (kinda) to my room, just in time to ditch the ipad, grab a hat and lather on more sunscreen. I am going to make this short and….well short. I’d like to say that I just don’t want to talk about it, but they say (especially Romans) that conversation is good for us….so, WHEN IN ROMA. This is where it begins. A little background- As I share Roma’s history with my students, I continue to find it fascinating. 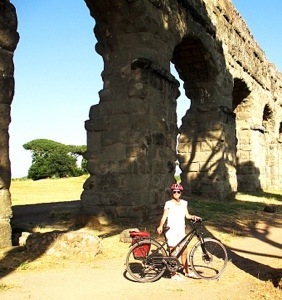 So I figured a good way to really get a feel for it was to bike their original road VIA APPIA ANTICA. I chose a 6 hour, 18 mile tour. Now those of you who know me, know the “idea” of the ride overtook the details, like how far, the terrain, 93 degree day….ya know, the details. But in my defense (which I restated a couple of times today) I did contact the company explaining my lack of biking stamina and they assured me that this is a ride for all…..now in THEIR defense, the site DOES list the milage (in kilometers…are those shorter or longer???) 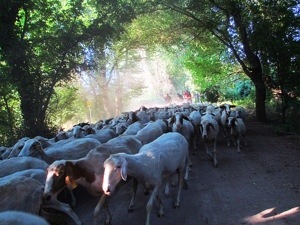 and the level of the tour “leisure to intermediate”. Anyway, back to the ride. There were only 2 other people going, male in their early 30’s….I asked! And of course Ricardo, the guide. Bottom line…the ride kicked my culo! Not only was the pace fast (“You think we were going fast?” Ricardo questioned.) but the terrain varied. As we went up a steady long incline at the entrance to the catacombs, I was certain I was going to have to ask San Sebastiano to scoot over. While waiting for our English speaking tour guide at the catacombs, I realized people were looking at me as if…well, there were no mirrors so I am not sure, but it wasn’t good. Thank goodness for the cooling temperatures in the catacombs. This part of the afternoon was very interesting. However, no photos were allowed. The information shared was overwhelming, but I look forward to reading more about them; something like 7 miles of tunnels and 80,000 tombs! 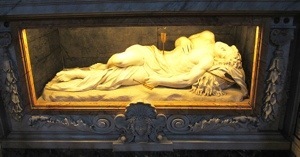 Of course, San Sebastiano’s tomb is in the attached church. 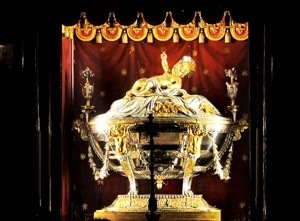 San Sebastiano is the patron saint of athletes, due to his endurance after being shot by arrows and left to die. After our last stop at a medieval, working farm, I was reenergized (a bit) and actually peddled my way to the front a couple of times, Ricardo noticed this. I figure it was just the horse heading to the barn thing. After that “adventure”, I stumbled to my room, showered and am heading to bed…not even dinner tonight. 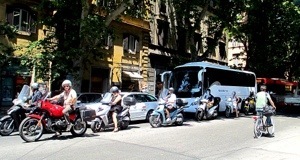 One little side note, the traffic/driving in Roma is crazy! But I have to say, watching someone text while on their Vespa zooming by, takes the torta! Absolutely inspired!! From what I’m seeing and reading I’m sure this trip has far exceeded your already fantastic expectations! I am so grateful you are sharing this with us!! 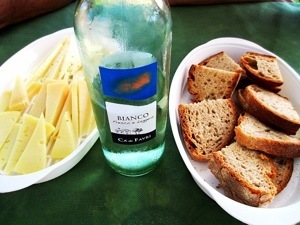 The photos are spectacular — and your descriptions – perfetto!! Oh Paige….oh Paige. Yes, agreed – you are very brave and I am so glad you are shring this amazing adventure!! Make that SHARING this amazing adventure. Having so much fun reading I can’t spell.